Lost 3.2 pounds in 8 weeks. 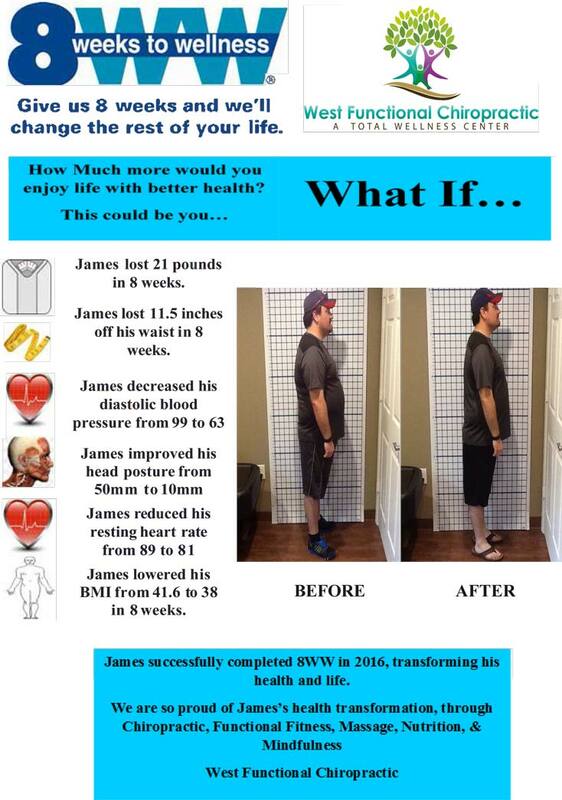 Lost 2.5 inches off his waist in 8 weeks. Lost 16.4 pounds in 8 weeks. Lost 11 pounds in 8 weeks. Lost 12.8 pounds in 8 weeks. Lost 3 inches off her waist in 8 weeks. Lowered his BMI from 41.6 to 38 in 8 weeks. 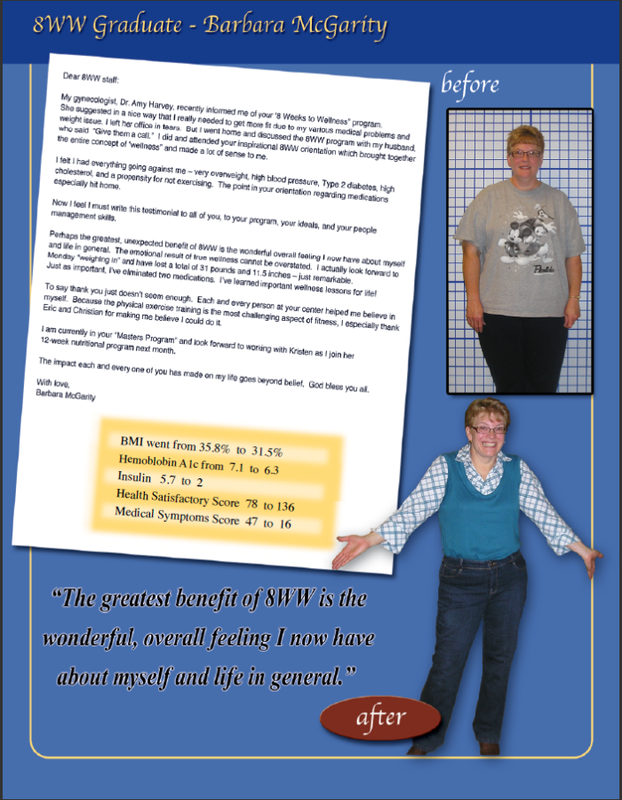 “The greatest benefit of 8WW is the wonderful overall feeling I now have about myself and life in general”. 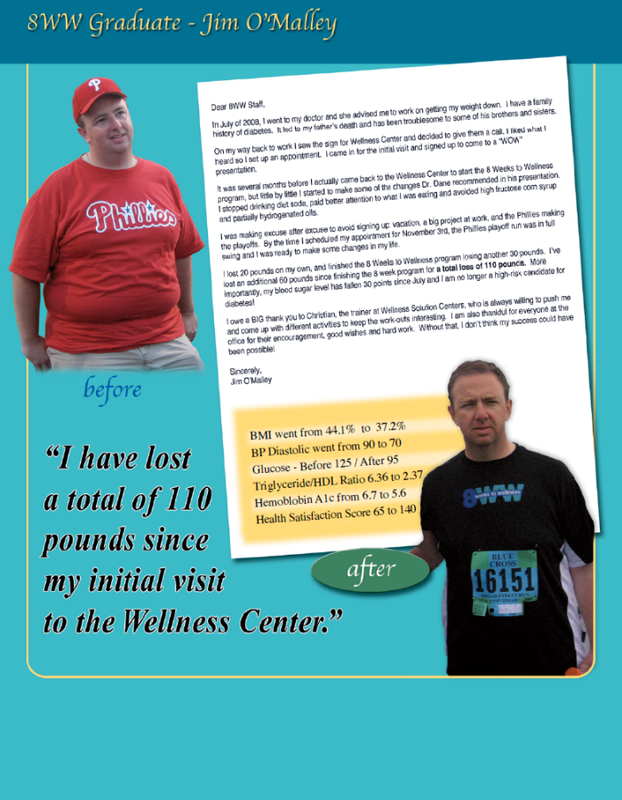 “I have lost a total of 110 pounds since my initial visit to the wellness center”. “All my blood work is within normal range. My clothes actually fit. I just simply feel good”. I sought chiropractic care initially years ago for severe lower back pain. I struggled with ongoing pain off and on for years with chiropractic care periodically. PT periodically, even back surgery and cortisone spinal injections. This past summer I had another severe episode while at a church kids camp. A friend recommended me to West Functional. I made an appt and signed up for the 8 weeks to wellness. Never before had I received a plan and teaching for my whole wellness. West Functional is amazing and truly cares about not only your pain, but YOU and making your whole body healthier. If you are experiencing life of pain and illness, you should definitely go see the amazing people at West Functional Chiropractic. I am now stronger! I can go up stairs and have more upper body strength and genuinely feel better! Thank you Dr. West and ALL the Staff! I started Chiropractic care because of numbness in my hand and headaches. Chiropractic care has helped me with both problems. I’m totally convinced a healthy spine is very important for a continued healthy life. I tell everyone I know to come visit Dr. West. She will make a difference in your life. My life has changed, allowing me to use my hand without it going numb. I’m trying to make better food choices and exercise more. Thank you West Functional Chiropractic! Car Wreck, resulting in neck & upper back pain. The adjustments when paired with massage therapy have significantly improved my quality of life. I am sleeping better and moving more fluid with ease. In addition to the physical care, the positive attitude of everyone in the office improved my day and outlook on life. A little positivity goes a long way! I seeked chiropractic care because I had bad back pain, neck and hip pain. I would tell hem that they should come to West Functional Chiropractic to get good care and help with what is going on. Chiropractic has made me feel better. I have had les pain in my back, neck and hips. I would for sure recommend any chiro care especially this place. Huge difference in in my well being both physical changes and immune! 20-25 yrs ago I fell on my bottom catching a fly ball while playing softball. Ever since I have had some back pain. Then degeneration, age and constant driving at work was aggravating it. A friend recommended Chiro. I was scared to have my body cracked, but finally succumbed. I wanted to stay active and would not consider surgery. Chiropractic care has been wonderful. It helped me continue to be active and pain so much more manageable. I can continue to ride my horses. The doctors and staff are friendly and always ready to help. I was wanting to receive chiropractic care because I was never feeling “okay” with my body. 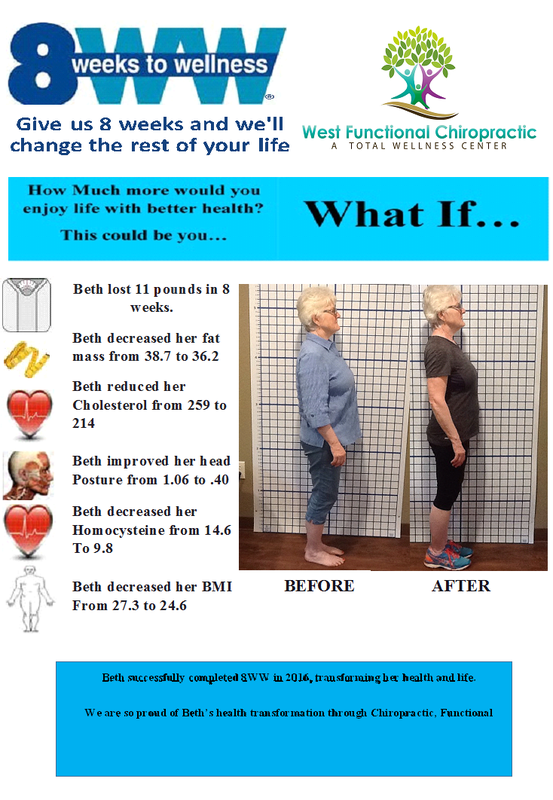 I would recommend West Functional Chiropractic to anyone needing help. Great care overall and I feel great! Before 8WW I weighed 290.8 lbs and my waist was 54inches. I lost a total of 21lbs and 11 ½ inches off my waist. I could barely walk before the program because of severe lower back pain. I was taking pain pills several times a day just to get through life. Now I take no meds and have zero pain. 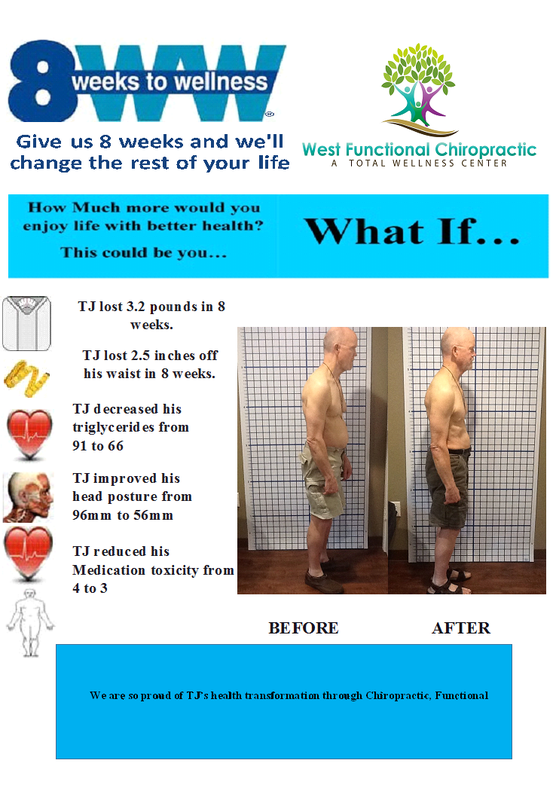 8WW and West Functional Chiropractic saved my life. Before the program I was going to work and coming home doing nothing but lying down because of the pain I was in. Doing the program I learned how to eat right, exercise and lower my stress levels with all that combined leads to a healthier lifestyle. After going through eight weeks of physical therapy at a rehab center for my lower back, it became more clear to me that I needed to get more than one area of my body realigned. Although the PT relieved symptoms, it seemed to bring to my attention other areas that needed help. The term “comprehensive” came to mind. I felt I needed a full-service team to address my concerns. Lucky for me 8 WW was 10 minutes from our house. The initial bloodwork & evaluation showed clearly where problems were. Dr. West customized the program for my particular needs. She chose supplements, defined the fitness training, scheduled chiropractic adjustments & massage based on that. 8 weeks later my LDL cholesterol had dropped 53 points, triglycerides dropped 100 points. I lost 5lbs & 3 inches off my waist. My D3 & glucose levels improved. Structurally I was more aligned & had more strength in my core & legs. During the first fitness session we discovered an oddball condition in my right shoulder. It was reassuring & encouraging to have the team work together to try to solve the mystery & implement techniques to facilitate improvement. All of the team had been through the 8WW & were still living the tenants of the program. They were all so encouraging, positive and quick with a helpful hint or a delicious recipe. They seemed to want me to succeed for my well-being & genuinely celebrated when my follow up results showed improvement. I’ve recommended the program to friends & wish some other family & friends lived close enough to participate. After two years of family health issues causing stress overload I found myself diagnosed with chronic fatigue, adrenal burnout, and very high EBV viral count. All of which affected my thyroid, blood pressure, cholesterol, hormones, and immune system. My lifestyle came to a screeching halt. I no longer had the energy to perform simple tasks. Dr. Jami West was already treating my chiropractic needs. 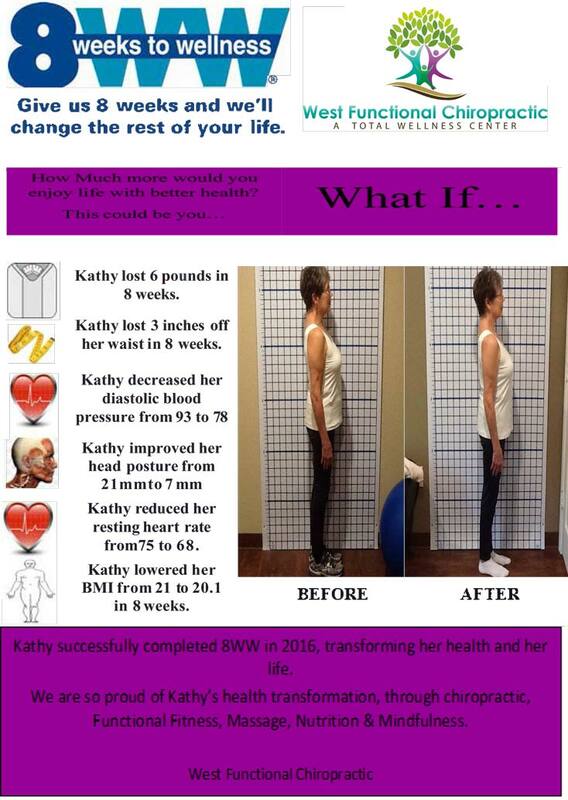 The timing was perfect for me when she incorporated the eight weeks to wellness program into her practice. When I committed to the program that they tailored to my specific needs, I felt assured of Dr. West and her staffs’ commitment to me. At the end of the eight weeks I had more energy I was eating healthier and exercising regularly. 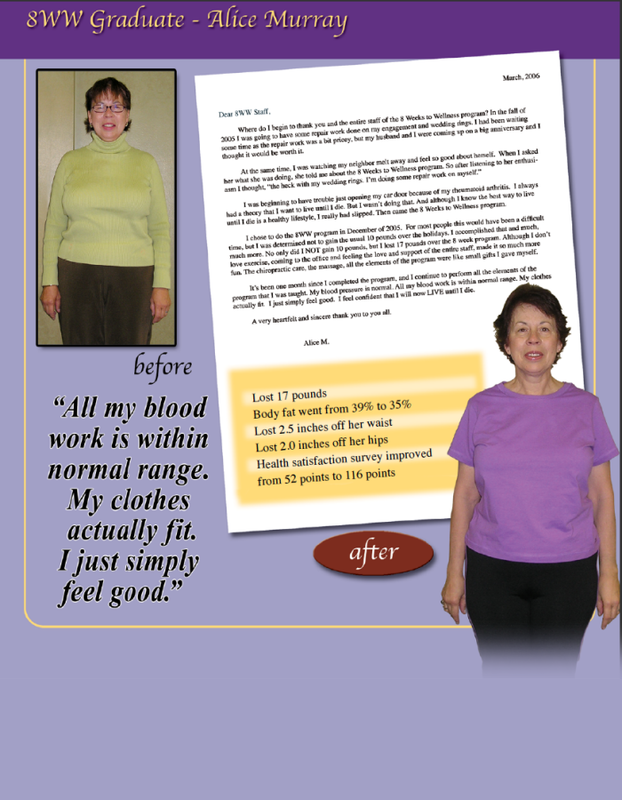 My blood pressure improved cholesterol lowered and my immune system was working again. It was a real bonus when I lost weight and inches. For me this was just the beginning! You cannot imagine my excitement and relief when I found out they had programs available so I could continue to improve my life with a great support system. I would not have been able to do what was necessary to regain my health and life back without the tools, support, encouragement and knowledge Dr. West and her staff provided me. Along with all the supplements great recipes and amazing massages. I felt like I had my own personal team supporting me. Dr. West, and her staff have been and continue to be a real blessing in my life. 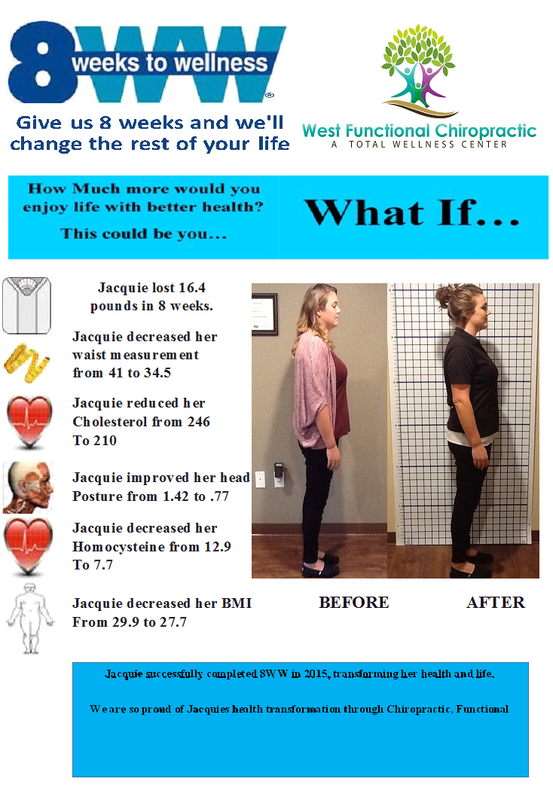 What made you come to West Functional Chiropractic? What have you learned from the chiropractic care/8WW program you have received during your care here? 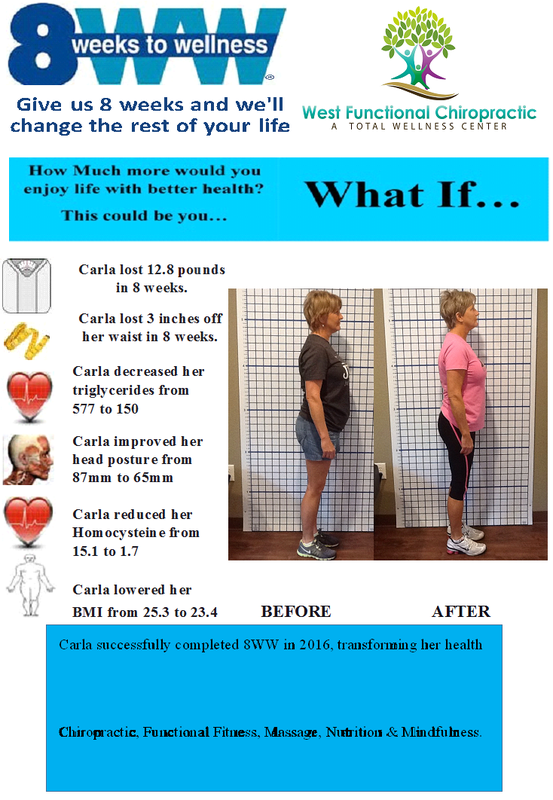 How has your life changed since you finished the care/8WW to wellness program? Would you recommend our off to your family and friends? In your own words, please explain your reason for seeking chiropractic care, and nay initial complaints. What advice would you give a friend, coworker, or loved one who was considering taking a step toward better health through chiropractic? 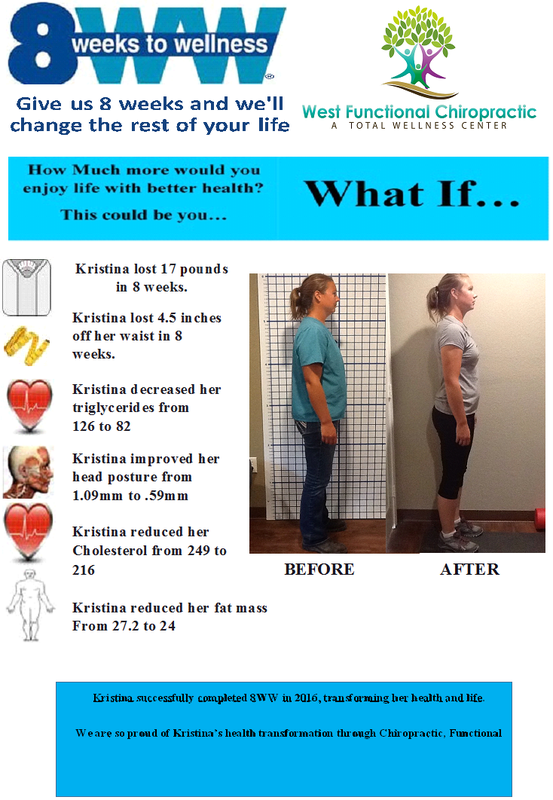 And finally, how has chiropractic made a difference in your life? I sought relief from nerve pain in my left groin to knee area. I wanted to avoid pain medicine. First time for chiropractic treatment and pleased with results so far. I still have some discomfort but learned how to stretch and help myself through process. For years I have had neck and back pain so bad it keeps me from doing the things I like to do. Dr. West and her staff have gone above and beyond to see to my needs. They not only take great care of you, but help you strengthen your body for a greater outcome. Today my neck and back are stronger than they have been in years. With the care and knowledge I have received here at West Chiropractic, I am ready for tomorrow! What if we go on vacation and I run out of my prescription? What if I lose my job and my health insurance (and thus, my prescription program)? What if I forget to have a few spares in my purse? I had researched and studied headaches my entire adult life. I knew what foods supposedly contributed to them, which activities, and which seasons (they are always worst in summer). But no doctor, EVER, was able to do more than prescribe more and more medication. When I moved to the Lake Kiowa area in October 2016, my headaches suddenly increased in strength and frequency. I went from having one every week or two to having them every couple of days. I would routinely run out of my prescription meds because the insurance company will only prescribe 9 per month. I was desperate. I was skeptical due to having gone to a chiropractor before who was so rough with me I was in pain for three days after the visit and vowed never to visit a chiropractor again. But again, I was desperate. After the initial consultation which included x-rays and test exercises to determine my spinal health and flexibility (I failed! ), I signed up for the entire program. And I am convinced that saved my life. The program was tailored to my needs, and along with the chiropractic manipulations, I was scheduled for deep tissue massages as well as an exercise program to improve my core strength as well as my posture. Drs. West and Romanies have “hands of steel,” yet they have a light-as-a-feather touch. They manipulated my neck and spine so effectively (yet gently!) that, for the first time in my life, I can go weeks – not days, but WEEKS – without having a single migraine headache. Never in my life has my head not suffered a migraine for more than a week to 10 days at time. NEVER. And now it does. Not only did they do the physical manipulations but they instructed me on how to do certain stretches and exercises at home which actually WORK. If I feel a headache coming on, I know how to avert it. They are true life savers. My quality of life has improved 100%, and now I’m not afraid of my headaches because I know relief in the form of West Functional Chiropractic is just around the corner. I will NEVER go to anyone else – they know me, they know my head, and they know how to keep the headaches under control. In closing, I’m not saying I don’t ever get headaches anymore. I AM saying that they are much more infrequent, less severe and I know how to prevent them from happening 95% of the time. This is nothing short of a miracle. Thank you, Drs. West and Romanies. You have truly saved my life. I seeked chiropractic care because I was having hip pain in my hip. I believe that if anyone is having problems and chiropractic care can fix it, they should do it. I started to feel better after my first week of appointments and I have never felt in better shape and happier with my body.